Yoga and jewelry? Not really the first thing that comes to your mind when you think of Warrior pose and OMs, right? But we all have a life off the mat. So what if you want to take your yoga with you and wear it around your neck wherever you go? One of the most beautiful ways to do that might very well be yoga jewelry. I took a look around the web and found some very inspiring yoga-compatible jewelry brands. Check out these pretty picturesque pieces of shiny yoga bling! 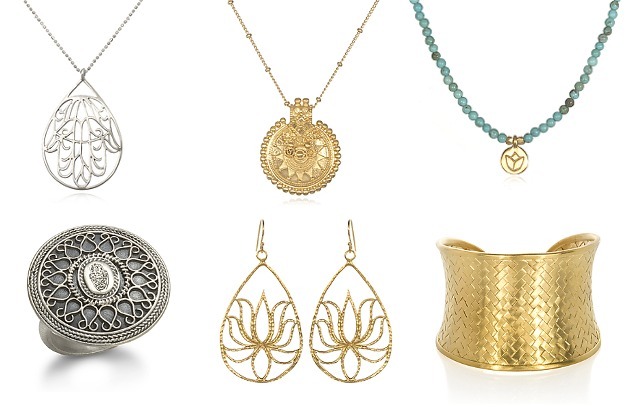 Mesmerizing mandalas, teardrop lotus pendants and stunning statement rings are what Satya jewelry has to offer. Satya means truth in Sanskrit and the company states that "this name is a reminder that being authentic is more than just an important value". Satya jewely designs and makes jewelry that is beautiful because of what it means. The in-expensive piece we found was $32 (earrings) and the most expensive piece was almost $1000 (also earrings). You can find their jewelry in their webshop, but we also found some bargains on Amazon. This is a jewelry line created by a Dallas-based yoga teacher. This one is definitely worth having a closer look at since it really has a very strong non-corporate feel to it (the website is a free blogspot blog... how cool is that?). 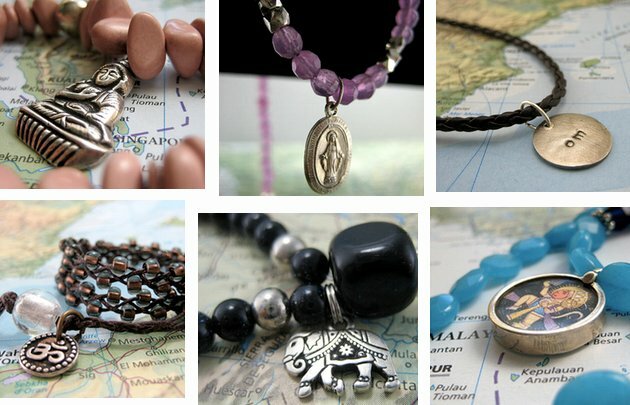 Moondog sells yoga jewelry for women and men, mala bracelets, Sanskrit mantra necklaces, and wire-wrapped beaded crosses. Their product line is actually pretty large. We counted over 100 cute little pieces in their online shop (which is hosted by Etsy, by the way). Go ahead and check out their jewelry on Etsy. The prices are super in-expensive. This is one of my favorites! BrooklynThread is "a collision of bohemian chic and urban style". Their jewelry is handcrafted in Brooklyn, New York. Its founder, Joanna Torres, loves stones, crystals, vintage findings, fabrics, and interior design and decided to merge all these elements into a super awesome jewelry brand. Apparently, the goal of BrooklynThread is to keep the brand small and not mass-produced, which i like a lot. While BrooklynThread has a bracelet line dedicated to yoga I found myself browsing and loving all their stuff (rings, earrings, necklaces, and more). Have a look at their online store. 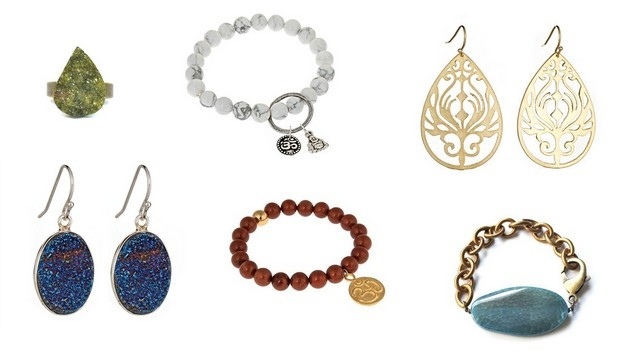 The prices are just as beautiful as their yoga jewelry. Miriam Merenfeld isn't really a yogi-brand. However, they sell all sorts of very high quality inspirational necklaces. The founder, Miriam, is actually an architect and thus her jewelry collections have a strong understanding of design. She obviously loves symbolic messages and spirituality. Note that their prices are not the most in-expensive (they use a lot of gold and silver!). So coming back to yoga, I found two pieces that I really liked and I wanted to share them with you here. 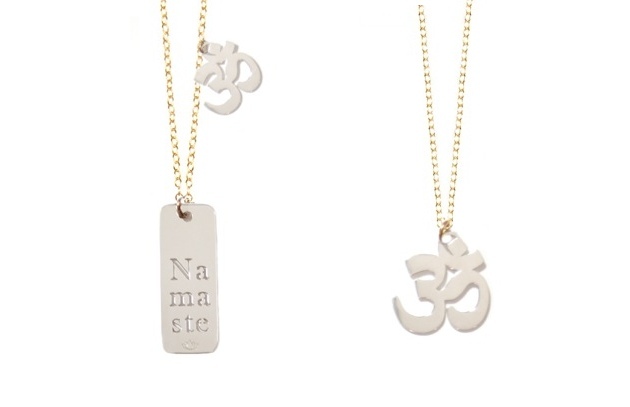 How about some OMs or Namastes around your neck?